Deepa Rajan, a second-year Chancellor’s Scholar at Vanderbilt University, is double majoring in Neuroscience and Music. Her interest in this rather unusual combination of subjects began in 2010 when she founded Harmonies for the Elderly, a non-profit organization dedicated to providing music therapy and enrichment services for people suffering from Alzheimer’s disease. Through this organization, Deepa has performed almost seventy concerts at nursing homes. Deepa is growing her organization on a national level and mobilizing hundreds of new student volunteers by guiding the development of new Harmonies for the Elderly chapters in different areas of the country, including Nashville. Deepa is a two-time recipient of the Presidential Volunteer Service Award for her committed efforts. The work that Deepa does with Harmonies for the Elderly centers on a novel clinical study that she conducted in 2012 under the mentorship of Dr. Connie Tomaino from the Institute of Music and Neurologic Function. After witnessing profound reactions from nursing home residents elicited by certain songs performed during Harmonies for the Elderly concerts, Deepa endeavored to compare the efficacies of different types of music therapy in improving the cognition of Alzheimer’s patients. Deepa published her results and incorporated her data in the creation of new programs for future Harmonies for the Elderly concerts. 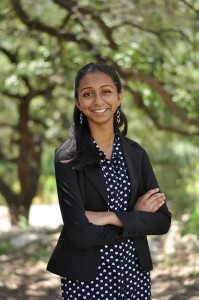 Inspired by her experiences with Alzheimer’s patients, Deepa joined the Pierce-Shimomura lab at the University of Texas in Austin in 2012, where she modeled the progression of Alzheimer’s disease in C. elegans nematodes in order to test the effects of different genes and proteins that might play a role in the onset of the disease. In her first year at Vanderbilt, Deepa studied mechanisms related to Parkinson’s disease and ADHD under Dr. Randy Blakely. Now, as a sophomore, Deepa is continuing her Alzheimer’s disease research in the Vanderbilt Center for Neuroscience Drug Discovery under the mentorship of Dr. Jerri Rook. Her present studies involve testing novel drugs that have the potential to alleviate the symptoms of Alzheimer’s disease in mouse models. Deepa, currently a student of Dr. Stephen Miahky at the Blair School of Music, is an accomplished violinist as well as an aspiring scientist. Deepa made her solo debut at age twelve accompanied by the University of Texas String Project Orchestra. She subsequently became a prize-winner and finalist in several concerto competitions and a three-time gold medalist in the Texas State Solo and Ensemble competition. She is the returning concertmaster of the Vanderbilt Commodore Orchestra and has engaged in a wide array of other major orchestral engagements – the most recent include performances with the Texas All-State Symphony Orchestra and with the Grammy-winning Westwood Symphony Orchestra at the International Midwest Clinic in Chicago. As the first-place winner in the International American Protégé Competition, Deepa will be making her Carnegie Hall solo debut in late November of 2015. Education activism is another area in which Deepa’s interests in music and neuroscience converge. Her involvement began in 2013, when she mentored low-income, inner-city students in Austin, Texas elementary schools. This initial glimpse at the effects of poverty on learning and wellbeing motivated Deepa to spend twelve weeks in a rural Indian village in 2015 in order to inform locals about healthcare practices and to establish a long-term “Music and the Brain” educational program at a school for girls living below the national poverty level. The program features group music therapy sessions, encourages the appreciation of classical Western music, and teaches basic neuroscience concepts to students in grades nine through twelve. Deepa trained teachers at the school in her innovative course curriculum to ensure the sustainability of the initiative following her departure. This program is one of the first of its kind in India. Deepa feels honored to be speaking at the TEDxVanderbilt event and is excited to reveal the beauty of music and the wonder of the brain to a broader population. Alzheimer’s disease is a tragic neurodegenerative disorder that steals away the building blocks of people’s lives: memory and cognition. However, people with this disease often viscerally remember parts their lives when they are guided by the live soundtrack to years of past personal experiences. This talk specifies the types of music involved in improving different aspects of cognition in people with Alzheimer’s, and the application of such music by an organization called Harmonies for the Elderly. This poignant discussion of Alzheimer’s disease reveals how music is a window into the beauty, fragility, and resilience of the human brain.